The acronym ECM stands for enterprise content management. An ECM system provides your company or organization with various technical tools and digital features that allow you to fully exploit the potential and added value opportunities that present themselves in daily business. However, ECM is more than just software: As a strategy and management concept for information technology, enterprise content management is a key future-oriented hub for information exchange, communication, and shared data use that is just as relevant to medium-sized companies as it is to municipal administrations and corporations. The ideal basis for this is our enaio® ECM software, which operates across the entire company. The enterprise content management information technology strategy and management concept concentrates the diversity of information and knowledge of a company or organization across the entire lifecycle (information lifecycle management) of a piece of information or a document. ECM encompasses “the technologies, tools, and methods for capturing, managing, storing, preserving, and delivering electronic content throughout the enterprise” (definition of ECM provided by the international ECM association AIIM). Electronic document management is a core function of ECM systems that provides unrestricted access to the information world of your company. Data/information and documents are merged into intelligent objects (e-records) in a context-related manner. This makes it possible to create customizable views for each user and/or workspace. Moreover, powerful features allow you to optimize the workflows for handling your documents efficiently and at any time. This means you can minimize or replace time-consuming and costly manual processes. What is special about digital document management with solutions from OPTIMAL SYSTEMS is that they are not limited to our ECM system, but can instead be deeply integrated into the existing IT landscape of your company via certified interfaces. Digital storage and audit-proof archiving of all documents and information makes it possible to secure knowledge over the long term, while saving costs at the same time. After all, losing knowledge or not finding it again can be very expensive. Two-thirds of the time invested in paper-based archiving is spent on processing documents. 97 percent of archival costs are personnel costs. And the total costs continue to grow as the size of your company increases. Digital archiving with enterprise content management from OPTIMAL SYSTEMS meets all relevant requirements with regard to evidential value and audit-proof storage, documentation authenticity, and retention periods (IT compliance and GoBD). Only authorized persons can view or edit documents. As a user, you also benefit from our high security standards and our technology partnerships with experienced storage management vendors. Enterprise content management is able to digitally map, simplify, and accelerate a vast range of workflows, information, and business processes. The basis for this are digital workflows that are used to model, control, monitor, and further refine various processes. You can choose your mix of ad-hoc, firmly structured, and smart-structured workflows. This results in an information platform where all steps and employees involved are optimally synchronized. 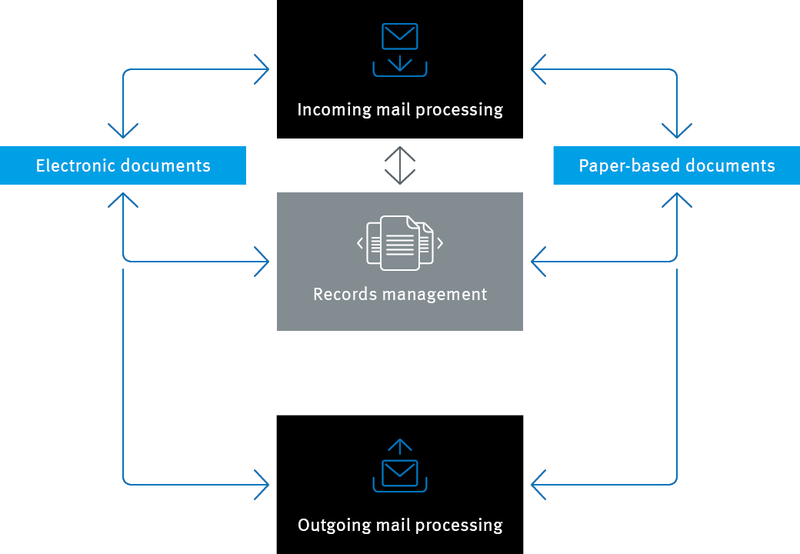 BPM with ECM from OPTIMAL SYSTEMS is suitable for any type of process, such as incoming mail processing including invoice verification, release processes, project management, and vacation requests. Information remains transparent and accessible throughout the entire lifecycle. Also, quality management is improved, costs are reduced sustainably, and company goals are achieved faster and more reliably. Enterprise content management with OPTIMAL SYSTEMS supports you in organizing the daily flood of data, information, and documents on a uniform platform. The infrastructure of the company or organization is mapped digitally by digitizing all components and creating seamless workflows. All individual modules are optimally harmonized and tailored precisely to your organization, your core business, and your interacting process chains. The result: efficient, holistic information management based on an all-in-one enterprise solution. You still have questions about Enterprise Content Management? Please do not hesitate to ask our digital transformation experts!